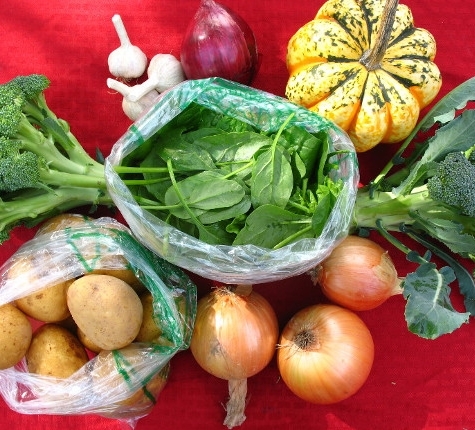 Spinach: our New Favorite Winter Vegetable! We love spinach at Hartwood Farm, but have been battling the weather for the crop these past few years. 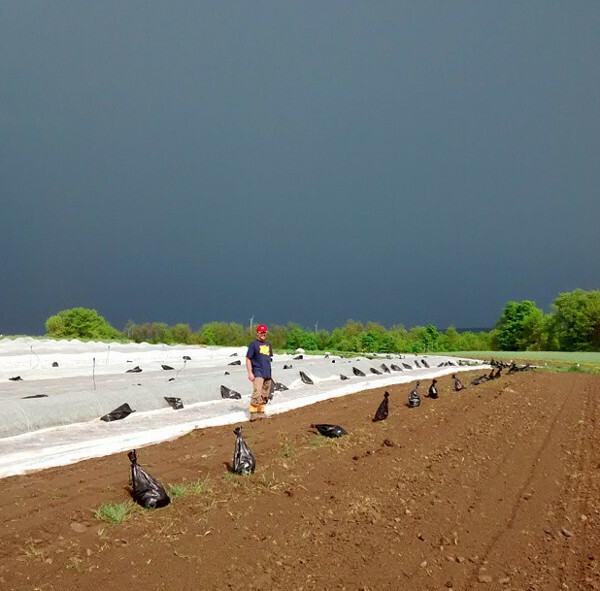 It seems like every time (or at least the past three years) the spinach is just about ready in spring, a torrential hailstorm shows up and turns the crop into a disappointing slaw. This winter is our first year doing winter high tunnel production, which means we are growing vegetables in the soil under the protection of a greenhouse (but with no added heat). It's led us to the epiphany that spinach can be a fun and satisfying crop to grow--just in the winter when we don't have to worry about hail! We have a bumper crop building up in high tunnel and are starting to bring it to markets this month--you can find us with it in the next weeks at the Fayetteville and Cazenovia winter markets! Winter spinach is a different beast from the pale spinach of the grocery stores. This stuff is super sweet, an incredibly intense green, and delicious! It is packed with flavor and adds a great spring punch to the normally root-vegetable-heavy meals of mid-winter. Spinach has a neat history. It's a member of the beet and chard family domesticated for its leaves in the Middle East and central Asia. It was brought to Europe through Spain by the Arabs in the late middle ages, where it gradually grew in popularity to become a European mainstay by the 1700s. Spinach had larger and more succulent leaves than many of the vegetables it displaced (crops like amaranth, orach, and lambs quarters) as well as a milder flavor, and the ability to grow in the cool spring and fall seasons. Now it's one of the most popular leafy vegetables in the world. Spinach leaves come in a number of shapes--some varieties are smooth-leaved, some savoyed with a beautiful crinkly pattern on them, and some arrowhead shaped. In the past we've preferred the savoyed, but are switching more to the arrowhead varieties for the spring since they survive hail better! In the winter tunnel, we have a beautiful semi-savoy variety, with a little bit of nice texture and wonderful flavor. Spinach loves cool weather and cool, moist soil. It can be grown year round in warm winter regions like Mexico, Texas, and California, but tastes best when it's in season here in the northeast (mid-May to mid-June and mid-September to October outside, and November through April in protected tunnel environments). We seed our field spinach as early as we can in spring and hope that it holds on into June for our CSA (fingers crossed for no hail this year!!!). This winter spinach we planted in our high tunnels in October and water every six to eight weeks. Winter spinach will grow a little bit in October and early November, but then goes dormant until the beginning of February, when we start getting a bit longer days. The increase in light triggers the plants to start growing again. As a kid, I was victim of the gray, overcooked spinach we had in the lunchroom, which turned me off of spinach for a while. However, prepared right, spinach is worth a second chance! It's a very nutritious and versatile vegetable and can be eaten raw or cooked. Some folks don't like oxalic acid in spinach--if this is you, it's likely raw spinach makes your mouth feel funny. I'm sensitive to oxalic acid and find that I enjoy spinach best lightly cooked rather then raw, since the cooking makes it more mellow. Spinach leaves, especially the savoy (wrinkly) varieties, can catch dirt and grit. We recommend double washing the leaves with a fair amount of agitation to get off any grit. Wait to wash the leaves until you are ready to use them--when wet, spinach will store poorly. Spinach can store for about a week. Keep it in a plastic bag in the crisper drawer. Older recipes often call for stemming spinach (removing the stem from each leaf), but we never bother with this--our spinach should be tender enough that this isn't a problem. In general, remember that spinach cooks super-fast and it is really easy to overcook it! You can also use spinach in many other recipes that call for cooked greens (substituting it for chard, kale, and more). Raw--after washing, spinach is great for salads. I usually mix up spinach leaves with lettuce or arugula so there are a range of flavors in the salad. You can use a regular dressing, or the spinach is also nice dressed with an olive oil and fresh lemon dressing. Spinach is my favorite green to use for a wilted salad. It's great with cooked veggies or meat added on top of it, which causes the spinach to cook a bit itself! Raw spinach is also a great addition to sandwiches, wraps, burgers, and more. Steamed--spinach steams fast, usually 2 to 5 minutes a pound. The only bad thing about spinach is how much it reduces in volume when cooked. One pound (usually 2 of our full bags) reduces down to one cup when cooked. I like to dress our steamed spinach with a splash of lemon juice, salt, and pepper. Sauteed or stir-fried--we saute and stir fry spinach either on its own with spices and oil, or in a mixed veggie stir fry (to make it go farther). Sauteed spinach is great on its own, or we use it as an addition to other dishes. In other dishes--spinach goes well with almost anything. We will add it to lasagna, pasta sauces, casseroles, quiche and frittada, and more. If you are adding it to an oven-baked dish, you want to make sure that you either saute it first, or bury it so that the raw leaves aren't visible (or they get crispy/burnt). Spinach brings a lot of moisture to the dish, so keep that in mind (for example, you might want to squeeze out the spinach if you are using it in a quiche and don't want a soggy bottom crust!). Spinach is also great added to soups in the last 10 minutes of cooking. Finally, spinach is super easy to blanch and freeze to use later (so if you have a bumper crop, you can preserve it's deliciousness for the deep winter! ).